Venezuela: Goodyear workers occupy plant | Fight Back! Valencia, Venezuela - This Friday, the workers of tire manufacturing company Goodyear occupied their plant in Carabobo state, in compliance with Article 149 of the Organic Labor Law for Workers, after the transnational illegally closed its operations in the city of Valencia on December 10. "We have realized the formal application of Article 149 of the Organic Labor Law which deals with the occupation of businesses by the working class, while we at the Ministry of Law, according to the law, endorse this process of occupation taken on by the workers," the official explained. Minister Piñate announced that in the coming days an administrative team will be named for the plant, which will be made up of representatives of both the workers and the management - if they decide to join - along with the Ministry. 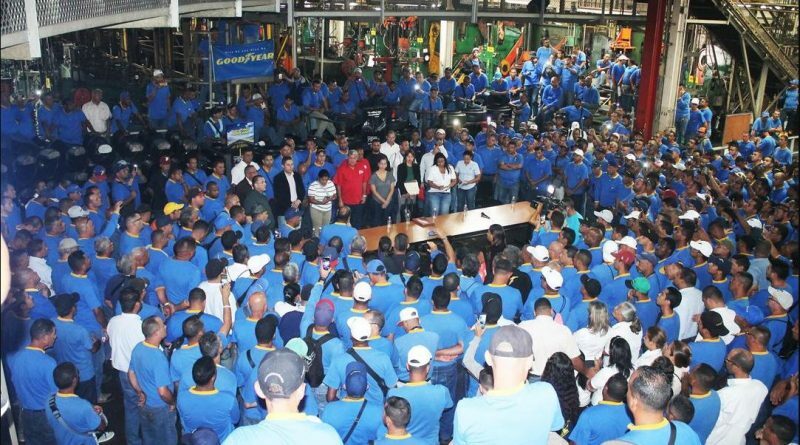 "We have total confidence in the Venezuelan working class, the working class of Goodyear, those who will put this plant into operation and advance the production of the country, so that the Venezuelan people can have sufficient rubber to continue repairing the automotive fleet," he expressed.